I can forgive the nonsense claim that you only command 5% of your brain because, overall, this book is packed with excellent tips. Many books about improving brain performance say things like you only use a small amount of your brain, which goes against all the neuroscientific evidence. However, don’t let that put you off; this book is worth reading. The book is broken down into sections to help you think smarter, solve problems, generate ideas and innovate. Each part of the book has practical tips you can use, many of which are backed by evidence from research. 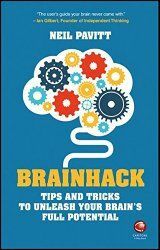 Brainhack is easy-to-read because it is broken down into small chunks. Each tip is only a couple of pages, so you can dip in and out as you wish. No matter how good you think you are at using your brain, you will find plenty of ideas in this book to help you improve. How to produce 486 blog ideas in 15 minutes To produce content ideas you need to use a system. The Search Bootcamp in London showed how.